2014 Jean-Francois Ganevat, Cotes du Jura Chardonnay “Le Montceau” Jura, France. Jean-Francois Ganevat can’t make enough wine to satisfy the world’s overwhelming thirst for his lovely and intriguing Jura wines, his tiny estate vineyard holdings only allows about 1,700 cases to be produceed, so he is exploring his options by buying fruit and making some Vin de France wines to bump up the numbers, some of which are really fun wines, but it is his estate, biodynamic stuff that has the world’s attention, especially his amazing Chardonnays, that can be compared to the best in Burgundy! People, including myself, have said these wines remind them of Raveneau or Jobard in intensity and style, and without question this are marvelous hand crafted wines with mineral intensity, dynamic acidity and have gripping leesy depth. The non oxidative stuff is just plain gorgeous, in particular look for the 2012, 2013 and the new 2014 wines, like this beautiful and crisp 2014 Le Montceau Cotes du Jura Chardonnay, grown on ancient Marl (limestone) and native yeast fermented, it has that vitality and vigor you dream about in white Burgundy, but with Ganevat’s touch and the terroir influence that is making even the Burgundian’s jealous these days! In this modern world with the reality of demand and climate change, these old vine Chardonnay plots in the Jura are going to be highly sought after and prized Crus for the long run and small artisan producers like Ganevat are all ready superstars, and wines like this show why, even though many worry traditional and old school Jura styles may fade away or lose their place. This concern is well worth considering, but we also need to celebrate those that manage a balance of styles and craft passionate wines, like Ganevat, these are honest wines of the nature and they have a seductive charm and flair that even importer Kermit Lynch couldn’t pass up, these rare goodies from the Jura are some of the hottest wines in his portfolio! 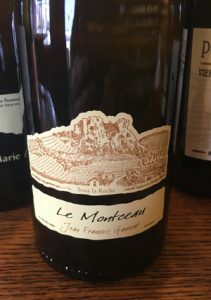 The Le Montceau starts with zesty citrus, chalk, white flowers and cool mineral tones with a palate of vibrant lemon, lime blossom, wet stones and flinty spice along with hints of clove, pear and yellow fig. With air things fill out a bit with apple, hazelnut and earthy notes, though always brisk and steely. Magic with food, seafood, cheeses, especially Comte, this vivid Chardonnay is lovely and joyous, it should drink wonderfully over the coming decade. All the current Ganevat offerings are stunning, be sure to search these wines out, the Savagnins and Chardonnays are awesome, but so too our the traditional Jura stuff including the Macvin and Vin Jaune!